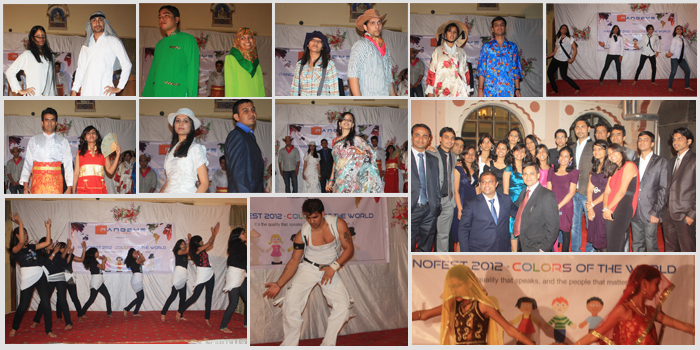 RanoFest 2012 – It has been a colourful celebration in this year’s family day event of Ranosys that was held in a grand fashion at the heritage property – Hotel Basant Vihar Palace, Bikaner (India) on 18 November 2012. Since its first year of inception, Ranosys has been celebrating this annual event every year inviting the family members of all its employees from all offices. The event has been seeing increasing participation, fun and appreciation from all associated. This year’s RanoFest theme was ‘colours of the world’ where the team celebrated and rejoiced its exposure, connection and associations with people from around the globe. Starting with the auspicious and authentic lion-dance video, the event witnessed various exciting performances from the Ranosys insider-talent that showcased that IT is not just about nerds or tech-savvy geeks. It calls for the guts to walk on the ramp wearing a Thai, Vietnamese or an Arabic attire for that matter, and being in the character. The evening, for some, was an opportunity to show-off those real six-pack-abs in a spell binding dance performance, and for some to mesmerise the audience by their romantic singing. The whole aura aroused our hidden Korean fans causing the stage to shake with their ‘Gangnam’ Style, where on the other hand our Indian Bollywood-fan beauties were where to be left behind. The Rano-emcees were dashing and took the evening in their stride. TEAM Ranosys is wired with this art of celebrating every little success together; and laughing-out-loud those silly errors while learning the right lesson and moving ahead. This event was a big day for all and it reflected on every face. The culture was shown in the fun, participation and zeal throughout; that makes events as such greater fun to be at.